A market leader in health insurance solutions, Max Bupa Health Insurance Company Limited is a joint venture between Bupa, a UK-based health services firm and Max India Limited. The Max Group has a rich background in insurance as well as healthcare and Bupa has immense experience in the healthcare industry with a 29 million customer base scattered across 190 countries. Max Bupa Health Insurance has insured over 28 lakh people to date and has settled claims that add up to Rs.1,141 crore. Max Bupa makes the claims process simple and does not involve any TPAs. The company promises to provide the pre-authorisation letter for cashless claims within 30 minutes. Direct claim settlement: All claims made with Max Bupa are settled without any hassles through a direct process. There is no third-party administrator involved and claims made are settled by the expert team of customer service representatives. Speedy cashless services: Max Bupa has a wide network of cashless claim networks that provide customers good quality health services within a time frame of 30 minutes of making a request. Comprehensive coverage options: Max Bupa offers an extensive and wide range of health insurance products that offer comprehensive coverage that caters to specific needs and preferences. International service: Those who opt for the Heartbeat Platinum plan will be eligible to avail the benefit of obtaining medical treatment in foreign countries for certain specified critical illnesses. Maternity benefits: Pregnancy, pre, and post-natal care are covered under the health insurance policies offered by Max Bupa. Also, children born to mothers who are covered under maternity benefits will be automatically eligible to be a part of the policy during the renewal process. Family coverage: All family members can be accommodated in a single plan, including senior citizens and newborn babies. Lifelong renewal: Max Bupa offers policies that can be renewed on a life-long basis without any hassles. *Premiums may vary depending upon factors like age, location, term of the plan and prevailing taxes/GST.  The Heartbeat health insurance plan is designed for individuals, couples, nuclear and extended families and come with different sum insured options depending on the number of people in the plan. Individual, couple and nuclear family plans come in two variants: Gold and Platinum. The plan for extended family comes in Silver, Gold, and Platinum options. This Health Assurance plan that is designed to provide critical care, accident and hospital cash cover to both individuals and families. Max Bupa - Health Companion is a comprehensive health insurance policy formulated to cater to both individuals and family needs. It offers customers hassle-free claim settlement and lifelong renewability. Incurred claim ratio basically refers to the percentage of claims that are successfully solved by the insurance company in a given financial year. Customer grievance redressal Max Bupa is has a customer grievance redressal mechanism that gives policyholders the platform to lodge complaints. This can be done by calling the toll-free number or writing an email. Renewing a Max Bupa health insurance policy is a very easy and hassle-free process and can be done online easily. Log on to the Max Bupa website and click on the ‘Renew’ option on the main page. Then simply key in your policy number, proceed and make payment. With over 3,500 cashless claim network hospitals across the country, Max Bupa provides customers quick cashless treatment services. To locate the nearest network hospital, log on to the website. A policyholder can seek an increase in the sum insured at the time of renewing the policy or in writing, However, this is at the discretion of the insurance provider. I am holding the health insurance policy with the MAX BUPA since from last 2 years where i have o claim experience with this policy but the premium i have been paying is 700 rupees for the complete family. The medical coverage is for 5L also the listed hospitals is very good. I have been using the health insurance policy with the MAX BUPA and i am using it from past one year as i have no claim experience with this policy and also added on that the medial coverage they have offered is 30L which gives the coverage for the complete family. I have started using the health insurance policy with Max Bupa and i have been renewing the policy for last 5 years. I have paid as Rs. 14000 for premium amount. They have covered a value of Rs. 2 lakhs and i have taken this policy for my family. Most of the hospitals has been covered and i have received a no claim bonus of Rs. 50000 for the current year coverage. I had a claim experience for my father. I had a very good experience with Max Bupa. They are very good in customer care and service. Within 1 hour they have processed my claim. They are always helpful when i any for help. They have offered Rs. 22 lakhs for combined policy for my father and my mother. I made a premium amount of Rs. 36000 which i paid for last time. The hospital list are also very good. First time I taken Max, the premium amount is good, I paid the premium around Rs. 6000, the medical cover is also good around of Rs. 6 lakhs, its covers for me. Its individual policy with the pre existing cover and also they send list of hospitals and the process is quick. I have been utilizing the benefits time in and out. They have some medical check up benefits also annually. They used to provide some vouchers which worth of Rs. 10000 from Life Style. My entire family has been covered in this policy. I have got a coverage amount of Rs. 10 lakhs and the premium amount of Rs. 60000. Max bupa is giving more incentive to the customer. The settlement was very comfortable to handle. I have health insurance with Max Bupa for me and spouse, my yearly premium is around Rs. 25,000 They gave me the medical coverage value of Rs.20 lakhs with cash less hospital and no claim features. But I done portably with different policy because of the high premium. I had been using the health insurance policy with MAX PUBPA where i have purchased it through online and using it since last 8-9months. It covers the accidental coverage also they offer the medical coverage of 10lakhs where i have paid the premium 4700k. They gave the coverage of critical illness and the pre medical also it covers. My health insurance is with Max Bupa. The customer service is good. I have taken a family floater. The premium is around 4999 which has to be paid on a yearly basis. The medical coverage is for 15 lakhs. The coverage is for three members in total. There is a cashless facility too. I am using since since 7 years. No claim. Premium is 14k that i have to pay for my insurance and that too for the entire family. Documentation is completely it is paperless approval. Coverage i have no idea. The hospital list is good. Because of their service i have taken this insurance. "GOOD POLICY WITH GOOD COVERAGE"
Got my health insurance from max bupa , It has good benefit s with limited coverage . Am paying annual premium through cheque . Am getting income tax benefits of 30 % from the tax . It has limited cashless treatment . Customer service and response is good in terms of documentation and response regarding queries. I had applied and got a Health insurance policy from the private sector insurance company MAX BUPA. My annual premium amount is Rs. 11,983/- which i feel is very high. There is no response from the customer end and they wouldn't sort out my queries. They have to improve their services. I have had taken a Health insurance policy from a renowed insurance company named MAX BUPA since three years. Most of all benefits are covered under under one policy. So no need to do top up my existing car insurance policy. Over all it is a good policy. They are providing cashless treatments facilities too. I had applied and got a Health insurance policy from the private sector insurance company MAX BUPA. It is a group policy. Recently i had a positive claim experience from the max bupa. My hospitalized bill was Rs.22,000/- i claimed around Rs. 20,000/- makes me very happy. I can prefer for online payments to renew my policy with in due time. I had applied and got a Health insurance from Max Bupa through a on line partner. I didn't have claim experience so i cant able to comment on it. The premium is very much affordable by comparing to all other insurances. I think no need to purchase other insurance polices because each and everything is good and all the benefits are covered under this policy. Till now everything is fine with Max Bupa, I got my policy copy on time. As my requirement they gave me all the features. I have taken health policy for my my parent. The premium amount was Rs.34,000 per annum has the medical cover of Rs. 8 lakhs for three person. Max Bupa is providing pre existing cover after two years of policy.